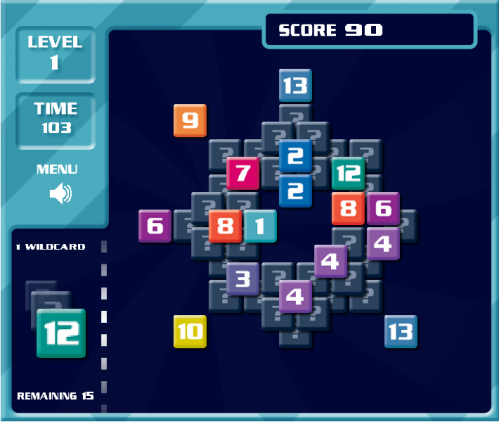 Description Blitz 13 is a solitaire tile puzzle game. The objective of the game is to clear the screen of tiles before the player runs out of tiles in their deck and wild cards. Tiles are numbered from 1 to 13, the current tile will be displayed on the deck, and must be cleared by selecting the next tile in sequence with a value of one greater or less. If the current tile has a value of 13 the player can select a tile with value of 1 and vice-versa. Try to string runs together to gain bonus multipliers and extra wild card. Beware long runs require forethought and strategy. Tackle each level one at a time and get the best score possible in each or try the endless mode to see how long you can last. Start the game by selecting a difficulty setting followed by the level you wish to play or select the endless mode. Play the game using the mouse to select tiles. At the beginning of each level either select the wild card or click the deck carousel (or press space) in the lower left corner to get a starting tile. Look at the value of the current tile and select tiles on the game board with a value one greater or lower than the current tile. Current tiles with a value of 13 can play tiles with a value of 1 and vice-versa. If there are no more tiles available to play either select a wild card, if available, or click the deck carousel (or press space) again. After selecting a wild card you can select any tile on the board. The game continues until the board is cleared of tiles, time runs out, or there are no more remaining tiles in the deck and no wild cards available. Nice solitaire #puzzle game with cool relaxing music! I like that!